Like all of the patents we highlight in our Stupid Patent of the Month series, this month’s winner, U.S. Patent No. 6,795,918, is a terrible patent. But it earns a special place in the Pantheon of stupid patents because it is being wielded in one of most outrageous trolling campaigns we have ever seen. Patent No. 6,795,918 (the ’918 patent), issued from an application filed in March 2000, and is titled: “Service level computer security.” It claims a system of “filtering data packets” by “extracting the source, destination, and protocol information,” and “dropping the received data packet if the extracted information indicates a request for access to an unauthorized service.” You may think, wait a minute, that’s just a firewall. By the year 2000, firewalls had been around for a long time. So how on earth did this applicant get a patent? A good question. Here’s how you get a patent on a firewall more than a decade after firewalls were invented. Step 1: File a description of your so-called invention that is nothing more than mundane details about how firewalls work. Step 2: Add some language saying this is totally not just a firewall. Step 3: Claim a firewall. With any luck, the Patent Office will just wave you through. To be fair, the ’918 patent suggests a firewall system that is not “user configurable.” The idea is that unsophisticated home users might misconfigure their firewalls so it is better to give them a system they cannot mess up. Just like a real firewall, only dumber! The patent also hedges its bets by claiming a system that is “substantially free from user adjustment,” whatever that means. Even if that was a new idea in 2000, this is not actually a technological improvement. It’s kind of like putting a padlock on the front hood of a car and then saying you’ve invented a new kind of car. The ’918 patent spent its entire life in well-deserved obscurity. 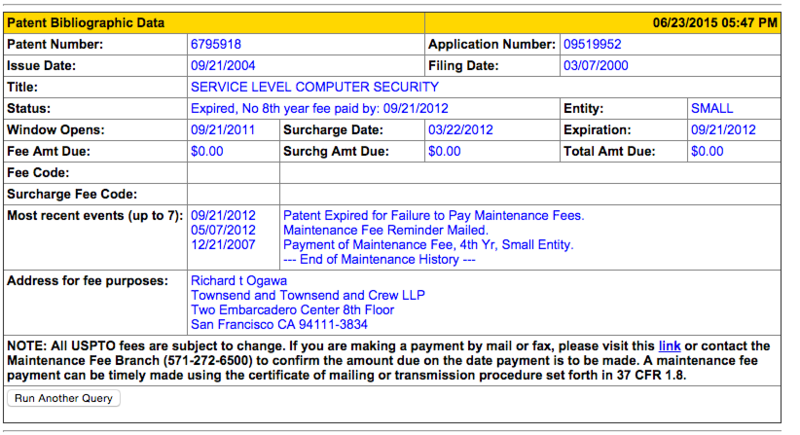 Indeed, the original inventor chose to let the patent expire in September 2012 by not paying the maintenance fee. This is unsurprising. Why waste money keeping a terrible patent alive? Usually, that is where the story would end. Unfortunately, even an expired garbage patent can be useful in the hands of a patent troll. In January of 2015, a newly-formed company called Wetro Lan, LLC, purchased the ’918 patent. Shortly after that, it began filing dozens of lawsuits in the Eastern District of Texas against companies that provide, you guessed it, firewall technology. The troll can do this because damages for patent infringement go back six years. So, technically, it can still demand damages for alleged infringement that took place from mid-2009 until the patent expired in September 2012 (though the defendants might have a good laches defense). Wetro Lan has sued just about everyone who sells a product relating to network security, from Avaya to ZyXEL. To take one suit as an example, Wetro Lan has sued Hacom, LLC, a small company based in Santa Ana, California, that provides embedded hardware, software, and consulting for implementation of open-source applications. In its complaint, Wetro Lan says that Hacom’s Phoenix IT-100 Appliance and its other routers directly infringe the ‘918 patent. But Hacom doesn’t sell anything remotely like the dumb, non-configurable, firewall discussed in the ’918 patent. They sell advanced products which enable users to configure settings through a web-based interface or at the command line. In fact, since Hacom’s products incorporate free software (free as in freedom), they are configurable down to the source code level. There’s no way that Hacom’s products infringe a patent that, even if it were valid, would cover only the dumbest of firewalls. But if Wetro Lan is like most trolls, that’s not the game here. The likely point of this litigation is to extract a nuisance settlement. We have significant doubts that Wetro Lan would ever litigate one of its cases on the merits, and win. The attorneys behind the Wetro Lan campaign are the same lawyers who sued our client in the Garfum v. Reflections by Ruth case. We desperately need legislative reform to stop more abusive litigation from these trolls. Such reform should include fee shifting, heightened pleading requirements, and venue reform to stop shell company trolls dragging innovators to the Eastern District of Texas. Without help from Congress, trolls will keep shaking down small companies like Hacom.